Provide PI control of insulation thickness on wire and cable insulation extrusion lines. Controls insulation extruders or capstan drives. May be used in other diameter-controlled extrusion processes. Integrates seamlessly with Proton Products InteliSENS® SL and SLR Series Speed and Length Gauges for line speed measurement. Integrates seamlessly with one or two Proton Products InteliSENS® DG and DG-k series diameter gauges for insulation diameter measurement. Single DG / DG-k gauge variant for diameter control (D variant) from either hot or cold measured diameter. Double DG/ DG-k gauge variants available for automatic shrinkage compensation (HC – Hot-Cold variant) control. Independent setting of tolerances, shrinkage, alarm functions and speed input. Large, high-resolution, back-lit, colour LCD screen with resistive touch panel. Product recipe presets for fast re-configuration between different product runs. Password protection (with different user privileges) for changes to settings and product recipe presets. SSFD (Single Scan Flaw Detection) for detection of insulation lump and neck flaws. 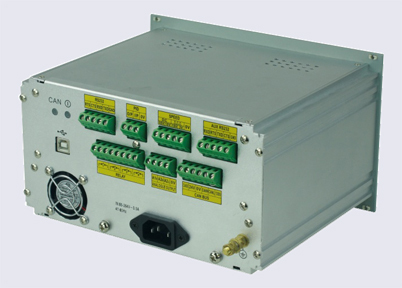 Housed in a rack-mountable enclosure (optional stand-alone mounting case is available). The Proton Products NEXiS® CS3G-C Series of controllers are for use on wire insulation or other extrusion production lines. NEXiS® CS3G-C Series controllers connect to Proton Products diameter gauges and speed and length gauges for measurement of insulation diameter and line speed respectively. These measurements are then fed into a PI feedback controller whose fully-isolated and floating output may be used to drive insulation extruders or capstan drives. Insulation diameter is thus actively controlled and kept in tolerance by the NEXiS® CS3G-C controller. NEXiS® CS3G-C Series controllers also have advanced features such as a large, high-resolution colour LCD screen with resistive touch panel, password protection, product recipe presets, and Single Scan Flaw Detection (SSFD, for detection of insulation lump and neck flaws). 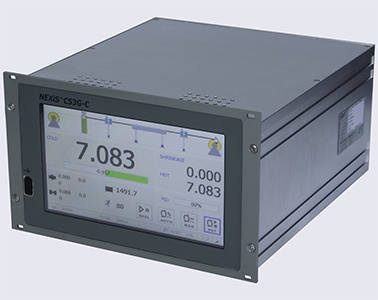 The NEXiS® CS3G-C is connected to the Cold DG / DG-k diameter gauge after the water cooling trough. The Cold diameter measurement is used to control the extruder so that the final insulation diameter is held within tolerance. Since the Cold diameter measurement is located far from the extruder, this control system response time is relatively slow (and dependent on the line speed), but the controlled diameter is the final product diameter. The NEXiS® CS3G-C is connected to the Hot DG / DG-k diameter gauge before the water cooling trough. A shrinkage offset due to cooling is set by the operator and used in conjunction with the Hot diameter measurement to control the extruder so that the final insulation diameter is held within tolerance. Since the Hot diameter measurement is located close to the extruder, this control system response time is relatively fast. The NEXiS® CS3G-C is connected to the Hot and Cold DG / DG-k diameter gauges before and after the water cooling trough respectively. The shrinkage offset due to cooling is automatically calculated from the Hot and Cold diameter measurements and used in conjunction with the Hot diameter to control the extruder so that the final insulation diameter is held within tolerance. Since the Hot diameter measurement is located close to the extruder, this control system response time is relatively fast and the user does not need to estimate a shrinkage offset.